– Pierce sweet potatoes with a fork and microwave on high until almost tender when pierced with a knife. Probably about 3-4 minutes. Cool and cut lengthwise into 1/2 inch pieces. 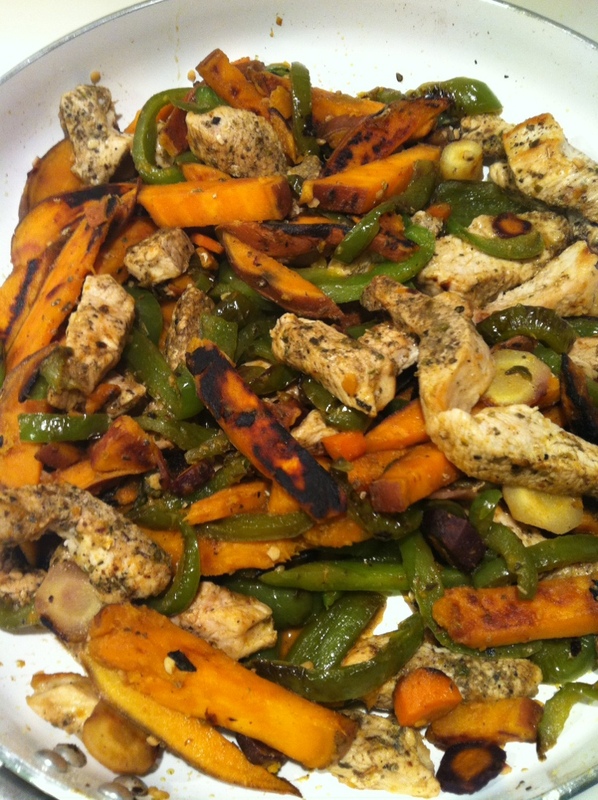 – On a skillet, heat 2 tbs of oil and add peppers, onions and sweet potatoes until golden brown. Transfer mix to a bowl. – Heat remaining oil and cook turkey and add all spices. Sauté until is browned. Return vegetables to skillet and add garlic and broth. Simmer until liquid is almost evaporated. Serve as a dish on its own or use as filling for fajitas. Either way it was delicious and a complete meal. Enjoy!! !